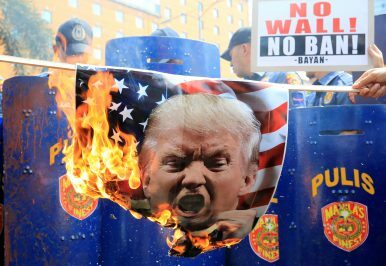 Filipino activists burn a portrait of U.S. President Donald Trump during a protest against U.S. immigration policies outside the U.S. embassy in metro Manila, Philippines (February 4, 2017). How the new administration should approach Southeast Asia and ASEAN. WASHINGTON, D.C. – Given the unprecedented attention that former U.S. President Barack Obama paid to Southeast Asia and the Association of Southeast Asian Nations (ASEAN) in U.S. Asia policy, it was always going to be a challenge for the Trump administration to match its predecessor’s level of engagement with the subregion and for the chattering classes to accept that sobering reality. And so it has proved, with some in Washington and in Southeast Asia already crafting various litmus tests for the new administration, including Trump’s attendance at the Asia-Pacific Economic Cooperation (APEC) summit in Vietnam and the East Asia Summit (EAS) in the Philippines in November. It would no doubt be a welcome development if Trump does end up scoring as well as Obama did on Southeast Asia and ASEAN, especially since this is the 50th anniversary of ASEAN’s founding and the 40th anniversary of U.S.-ASEAN relatios. But it is also true that given Southeast Asia’s traditional position in U.S. foreign policy, the Obama administration’s unprecedented commitment to the subregion, and the Trump administration’s vision for the region thus far, that test may seem unfair and the metrics might not be quite as applicable. A more meaningful and ultimately more rigorous ASEAN test for the Trump administration, beyond a single event or metric, is whether it can preserve the U.S. role as a capable and willing Pacific power seeking to advance greater security, prosperity, and democracy in the Asia-Pacific while working with Southeast Asian states on common challenges in a way that advances U.S. interests but still preserves their autonomy and freedom of action. Any attempt to assess a new U.S. administration’s Southeast Asia policy should begin with an understanding of the subregion as well as its place within broader U.S. foreign policy. Southeast Asia is a diverse region that has interacted with a range of major powers through the centuries. The region’s history may be summarized as a search for unity in the face of diversity, represented by the ten rice stalks on the flag of the Association of Southeast Asian Nations (ASEAN), initially founded in 1967 by Indonesia, Malaysia, the Philippines, Singapore, and Thailand (or the “ASEAN five”) after two other failed and short-lived regional groupings. Over time, Southeast Asian states have grown accustomed to adjusting their foreign alignments to cope with their own domestic development, interactions with other regional states, and the changing nature of major power competition. Though U.S. attention to individual Southeast Asian states tended to vary, Southeast Asia has also traditionally occupied a marginal role in U.S. foreign policy in general and U.S. Asia policy in particular, unlike China or Japan, which both loomed much larger. While the U.S. presence in some Southeast Asian countries was evident in decades before, the subregion only really rose to prominence in the context of threats to the United States and to its European and Asian allies and partners, be it from Japan during World War II or the Soviet Union during the Cold War. As smaller countries, Southeast Asian nations have also felt the changes in U.S. commitment to the Asia-Pacific most acutely in the past few decades, from the American withdrawal after the Vietnam War to the decline in U.S. presence following the end of the Cold War. By the late 1990s and early 2000s, Southeast Asia’s importance as a subregion had grown significantly but U.S. policy had in some cases not adjusted to give the subregion the attention it deserved. Economic growth among the original ASEAN Five, Southeast Asia’s centrality in addressing challenges from terrorism to China’s rise, and ASEAN’s transformation from an anticommunist bloc to a forum for major powers to engage made the region’s importance clear. Yet U.S. attention continued to wax and wane depending on the threat of the day, be it the Asian Financial Crisis of 1997 or the war on terrorism in the 2000s. Though this was to be expected, it also prevented the rise of a more strategic, regionwide, and balanced approach to Southeast Asia. Though some of the steps had begun during George W. Bush’s second term, Obama was the first president who really elevated Southeast Asia’s importance within U.S. Asia policy and significantly boosted U.S. commitment to the subregion to back this up. Indeed, arguably the most significant aspect of the Obama administration’s rebalance to the Asia-Pacific has been the greater share of attention devoted to Southeast Asia as well as ASEAN as a whole within U.S. Asia policy – what came to be known as “the rebalance within the rebalance.” (See: “US Asia Policy After Obama: Challenges and Opportunities”). Under Obama, the United States ratified the Treaty of Amity and Cooperation, became the first non-ASEAN country to appoint a resident ambassador to ASEAN, joined the East Asia Summit, institutionalized annual U.S.-ASEAN summits that the president has attended regularly, and even held the first-ever U.S.-ASEAN summit in the United States (See: “Why the US-ASEAN Sunnylands Summit Matters”). The administration also made significant inroads in building out U.S. alliances and partnerships in Southeast Asia, from the inking of new strategic and comprehensive partnerships with countries like Indonesia, Malaysia, Singapore, and Vietnam to the signing of a new Enhanced Defense Cooperation Agreement with the Philippines. As I have repeatedly emphasized, these are no small feats for a U.S. Asia bureaucracy that still continues to be largely dominated by Northeast Asian concerns. That said, U.S. Southeast Asia policy under the Obama administration also continued to be dogged by a series of challenges stemming both from its engagement of the subregion as well as its broader Asia policy. Most clearly, on China policy, the administration’s eagerness to ease Beijing’s insecurities and collaborate on issues like climate change – initially dubbed “strategic reassurance” – made it difficult for Washington to deal with an increasingly confident and at times assertive Beijing, with the South China Sea being a case in point (See: “US South China Sea Policy After the Ruling: Opportunities and Challenges”). In the economic realm, despite the administration’s best efforts, the failure to pass the Trans-Pacific Partnership (TPP) – which involved four Southeast Asian states: Brunei, Malaysia, Singapore, and Vietnam – during its tenure paved the way for the pact’s eventual downfall, leading to a lost opportunity to structure U.S. economic statecraft in Asia. And on the democracy and human rights front, though officials were correct when they tirelessly argued that U.S. policy had to depart from the lecturing of Southeast Asian states seen in the past, the failure to define an alternative vision – as opposed to individual initiatives like town hall meetings and the Young Southeast Asian Leaders Initiative (YSEALI) – gave way to the perception that this was not a major priority relative to other U.S. interests. For all the apocalyptic post-election predictions about the collapse of the regional order, after a bit of a rocky start, the Trump administration’s engagement in Asia has thus far represented far more continuity than the naysayers initially suggested (See: “What Will Donald Trump’s Asia Policy Look Like?”). That applies to Southeast Asia too. The nixing of TPP, the questioning of the One China policy, and the Trump travel ban (which led to unsubstantiated rumors about a potential expansion to cover Southeast Asian states) had all sent anxieties throughout the region about what it might expect from an “America First” foreign policy. At the same time, it is still early days, and engagement appears to be slowly taking shape. Earlier this month, U.S. Secretary of State Rex Tillerson met ambassadors and charge d’affaires of ASEAN countries here in Washington, D.C., where he attempted to ease some lingering concerns about U.S. policy toward the region. And though staffing has indeed proceeded much slower than previous administrations, diplomats and officials from individual ASEAN countries have also begun meeting Trump administration officials at various levels and tried to schedule visits through 2017. More is to come: U.S. Vice President Mike Pence will visit Indonesia next month as part of a wider Asia tour, and a meeting between Tillerson and ASEAN foreign ministers is also expected soon. As U.S. Southeast Asia policy begins to take shape under the Trump administration, what might be a fair test to judge it by? We have already seen that actual policy will depart – often significantly – from Trump’s campaign rhetoric and the administration’s initial signals. This reflects the transition from campaigning to governing as well as the reality that an administration’s Asia policy is usually judged less by its initial approaches than its eventual responses to ongoing developments. Similarly, individual metrics like visits are poor indicators of the U.S. commitment to Southeast Asia in any administration, especially since the past three U.S. presidents – Obama included – have all missed or nearly missed Asia trips because of either concerns in other parts of the world or at home (See: “The Pivot Lives On, With or Without Obama”). More meaningfully, the Trump administration’s real ASEAN test is whether it can preserve the U.S. role as a capable and willing Pacific power seeking to advance greater security, prosperity, and democracy in the Asia-Pacific while working with Southeast Asian states on common challenges in a way that advances U.S. interests but still preserves their autonomy and freedom of action. That means accomplishing five things. First, the Trump administration must ensure that the United States remains focused on Asia in its foreign policy. Since the end of the Cold War, we have witnessed a dynamic where Asia’s rising importance in the world has often not been matched by its place in U.S. foreign policy, with Washington periodically becoming distracted by concerns in other regions from the Balkans to the Middle East. At its broadest level, the rebalance was an attempt to correct this, with the United States prioritizing Asia even as it continues to address concerns in other parts of the world as any global superpower does. Though the Trump administration may not adopt the rebalance term itself, it must embody its spirit and ease concerns about the sustainability of U.S. commitment to the Asia-Pacific. It is difficult to talk to a Southeast Asian official or diplomat today without them mentioning the possibility that the United States may once again become embroiled in a quagmire in another region – likely the Middle East – that will take the U.S. focus away from Asia. “The last thing we want is to go back to the future again,” one Southeast Asian diplomat recently told me in Manila. Easing worries that its America First vision does not come at the expense of an Asia First foreign policy should be a top priority for the Trump administration. Second, the Trump team should rebuild the foundations of American power that undergird a sustained U.S. commitment in the Asia-Pacific. Though doomsday forecasts of U.S. decline are vastly overstated – as they have been nearly once every past decade or two – it is also true that the fiscal irresponsibility and political dysfunction we have witnessed over the past few years have heightened anxieties about the staying power of the United States. Though this is a task for multiple administrations, the Trump administration has an opportunity to begin to make some headway in building the domestic base for U.S. Asia policy. On the military side, some of this is already underway and holds promise, with a more robust defense budget and a commitment to end sequestration. But must be balanced with moves in the economic and diplomatic realms, lest it feed into the nagging regional complaint that U.S. policy is overly militarized. On the economic side, that means addressing structural issues like infrastructure development and putting in place a trade policy that is better aligned with the desires of the broader American population. TPP’s demise makes it even more urgent for the administration to move forward with some kind of economic initiative, even if it is a couple of key bilateral deals or other piecemeal arrangements. Third, the Trump administration must find the right balance between engagement and balancing on U.S.-China policy. While it is not uncommon for U.S. administrations to initially struggle to find their footing when it comes to China, thus far, rightly or wrongly, some serious Southeast Asian observers perceive a wild swing in the administration from an extremely hawkish line to an overly dovish one, leading them to entertain scenarios such as Trump making a deal with Beijing on North Korea at the expense of other issues like the South China Sea. Though these fears may be misplaced, perceptions can quickly create their own reality in Southeast Asia. The Obama administration arguably did a better job engaging China where it should rather than confronting Beijing when it had to. The Trump team must find a better balance soon and signal this to the region, because it will play into how these countries determine their approach to China. That means not just “getting tough,” but calibrating that with some tangible, practical ways to cooperate with Beijing in the region where possible as that would reassure the region that both powers are committed to a constructive relationship. In that respect, Southeast Asian states will be carefully watching the upcoming summit between Trump and Xi, which is expected to take place as early as April. Getting this balance right would also boost the administration’s ability to then work with wobblier Southeast Asian states, notably the Philippines, about how to deal with a rising China that presents both an opportunity and a challenge for them. Fourth, the Trump team should think about its commitment to Southeast Asia not just through the prism of narrow threats, but enduring interests. Asking more of individual Southeast Asian states as well as ASEAN on issues that are central to U.S. interests – be it battling the Islamic State or confronting China – is understandable and could even be productive if done right. But the Trump administration must also recognize that an unbalanced China policy or an overhyped threat perception with respect to terrorism could also diminish support for the United States amongst the populations of these countries as well as overly restrict the options that policymakers need to preserve for their security and prosperity. Similarly, even if Trump’s attendance record in Asian summits ends up being spottier than Obama’s, his administration must demonstrate a commitment to multilateralism in Southeast Asia. Even if ASEAN does make haste slowly, Southeast Asian countries and ASEAN as a bloc are important actors in addressing challenges that Trump and his advisers believe are important, including terrorism and maritime security. And though Trump or his other cabinet officials would have to patiently contend with usual pomp and circumstance associated with such summits, these would also be valuable opportunities to engage with certain important bilateral states on the sidelines of these meetings, including the ASEAN chairs (the Philippines in 2017 and Singapore in 2018). Bilateralism and multilateralism are not as mutually exclusive as some would have it. Fifth and finally, the Trump administration needs to ensure that democracy and human rights remains a key pillar of U.S. Asia policy. Trump himself is often portrayed as evincing little interest in the advancement of American ideals, with his focus more on advancing narrow U.S. interests in a transactional way. Yet getting it wrong on rights would be a mistake. Beyond jeopardizing the longstanding U.S. commitment to these aforementioned ideals, the perception that the administration would be willing to simply throw democracy and human rights out the window with certain states, such as Thailand or the Philippines, would reduce U.S. leverage on these countries, some of which already have inflated expectations about the forthcoming U.S. approach in this realm. Setting out a clear line would also enable the Trump team to get ahead of events, with elections in Malaysia and Cambodia coming up in 2018 that could both see historic transitions or contested outcomes. At home, this would also open the door to other actors within the U.S. foreign policymaking process exerting limits on the development of these relationships, thereby complicating ties between the various branches of government. Rather than viewing rights as a challenge, the Trump team should view it as an opportunity to advance values that are central to the United States relative to other actors like China. This rigorous test is no doubt a much higher bar than the attendance at a couple of summits, and passing it will no doubt prove challenging. But it is also a more meaningful one. And if the Trump administration makes an early start, it can make some headway on a number of these fronts quickly. Prashanth Parameswaran is Associate Editor at The Diplomat Magazine based in Washington, D.C. and a non-resident doctoral candidate at The Fletcher School of Law and Diplomacy at Tufts University. He writes extensively about Southeast Asia, Asian security affairs, and U.S. policy in the Asia-Pacific. Follow him on Twitter at @TheAsianist. This article draws on insights from remarks given at Georgetown University on March 22 on U.S. policy in Southeast Asia, and from the author’s recent trip to several Southeast Asian countries in early March.